Afghan citizens went to the polls on August 20, 2009 after a controversial delay recommended by Afghanistan’s Independent Election Commission to allow ample time to prepare for fair and safe elections. Karzai was favored to win the election amid a large pool of contending candidates; the most serious challenge coming from former Foreign Minister of Afghanistan Abdullah Abdullah. In pre-election polling, Abdullah gained significant momentum as election day drew nearer and other candidates dropped their campaigns. In a clear reference to the protests following the June presidential election in Iran, Abdullah’s campaign manager was quoted predicting street violence if Abdullah doesn’t win. 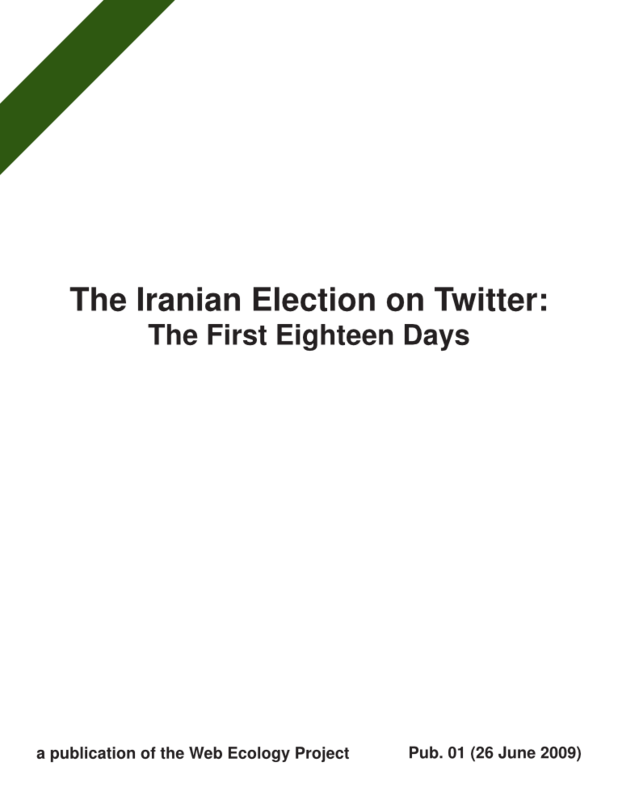 Here at the Web Ecology Project, we wondered if Twitter would play as significant a role in reporting the election as it did in Iran. In a country where mobile phone subscriptions add up to an estimated 50% of the population, but internet access was roughly 1.5% at last estimate with the status of network expansion [pdf] unclear, could the available ICT infrastructure and awareness of social media prompted by the “twitter revolution” in Iran enable a similar phenomenon post-August 20? 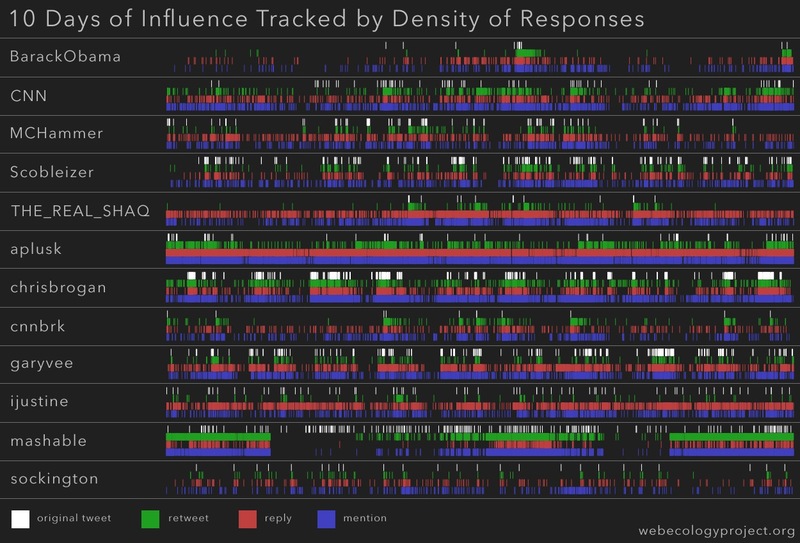 Using a new methodology based on the content and responses of 12 popular users, we determined measurements of relative influence on Twitter. 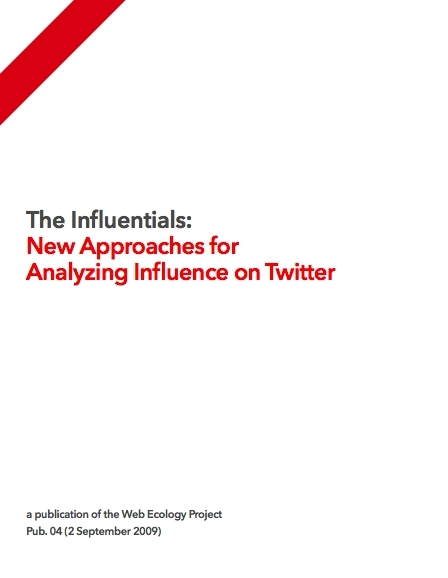 We examined an ecosystem of 134,654 tweets, 15,866,629 followers, and 899,773 followees, and in response to the 2,143 tweets generated by these 12 users over a 10-day period, we collected 90,130 responses published by other users. mashable is more influential than CNN. sockington is more influential than MCHammer, while MCHammer is more influential than three major social media analysts (garyvee, Scobleizer, and chrisbrogan). Celebrities with higher follower totals (eg., THE_REAL_SHAQ and ijustine) foster more conversation than provide retweetable content. News outlets, regardless of follower count, influence large amounts of followers to republish their content to other users. Click to expand image. A larger version with more temporal depth is linked at the bottom of this report. We would also like to thank Jon Beilin, Mac Cowell, and Tim Hwang for their invaluable contributions, feedback, and support. We would like to thank Jonathan Beilin, Evan Burchard, David Fisher, Tim Hwang, Alex Leavitt, Dharmishta Rood, Max van Kleek, Jue Wang, and Seth Woodworth for their invaluable feedback and support. Like the web itself, the study of the web is mostly an improvised structure. A group of progressive scholars, swept up by the technological transformation of the past decade, have done their best to keep up with understanding the massive cultural and social effects of our communication infrastructure. Not surprisingly, the inevitable outcome of this state of affairs is that the body of research about the web is fatally fragmented. Economists are caught attempting to assert dated models against new motivational frameworks. Journalists attempt to prescribe weak methods to maintain traditional standards around the creation and transfer of information. Marketers and social media experts, still largely divorced from a universe of quantitative and technical research, fail to provide a useful approach. 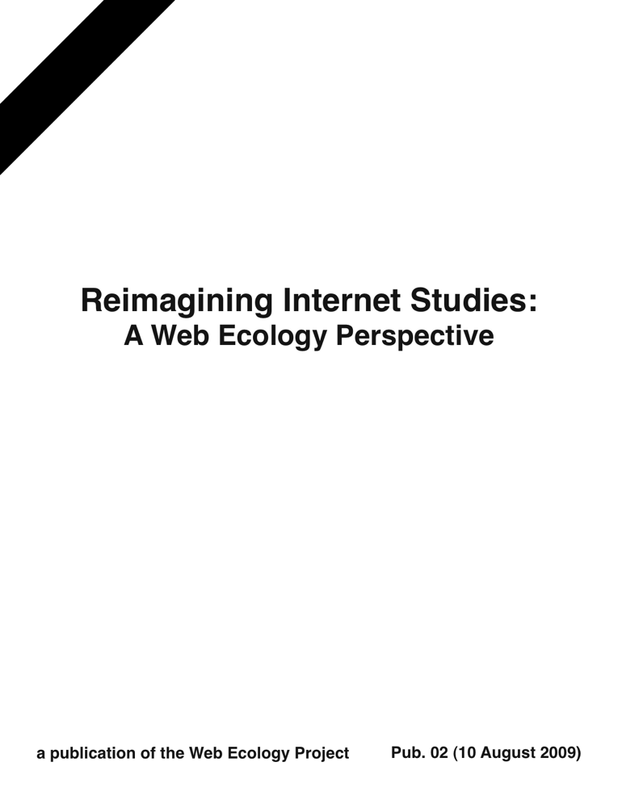 No coherent body of research has emerged focusing on studying the internet as the internet. This has resulted in fundamental weaknesses in the approach to studying social phenomena online. Relevant approaches are being ignored and opportunities for applying cutting edge research from a number of siloed traditions are going unexplored. tweets about the election in Iran. contribute 14.1% of the total number.